I’m not very big on gambling though. Technically it still is. Not sure where you derive this is “gambling”. Gambling requires risk, by its very definition, taking a risky action in the hope of a desired result – what’s your risk here? Are you buying groceries you don’t need? Like anything else, it can be taken too far, but at its core it’s a game of chance, not gambling. If anyone has the following pieces please contact me. Willing to buy, trade, or split prize.. I need 8y14f, email me willing to split. Email me a pic [email protected] I have the other. That’s nice Trey, however I hope your cash amount is extremely high because piece 8Y14F is worth about $600,000 (that’s what the 1 million annuity is worth). Are you sure that you need A502C and not A403C? Because that is the one that I have. I have ?622D need it? I do want ?622D. Could you please email me at [email protected]. email me at [email protected] if you’d like to either purchase of make a great business deal. Don’t waste your your time with “Nicole”!! We emailed her and she tried to convince us to send money without her sending any proof. This person is a scam artist!!! Period. She did the same thing to me. I have the F you’d need to complete the set. I have 8Y16H. Are you willing to buy H? What city do you live in that you go this from? Have 8Y16H also. Will walk to the moon to make a deal. Hold the phone Louie, we may have a deal. Email me ASAP ! What city do you live in that you got this from? Hi do you still have the f? we would like to see picture of ticket willing to pay money for it…. I am just a teenager that decided, what the heck, why not? I got into it and ended up needing only 1 game piece for each prize. any tips? everyone at school is shoving money in my face for me to give them one of the $1,000,000 game pieces but i refuse to do so. Unless you have one of the rare game pieces – take their money. All the game pieces are easy to come by, except the rare pieces. The rare portion of the 1M, for example, would be 1/400,000,000 chance of finding, only one in every four hundred million pieces printed will be that finishing piece. Do you have these or need these? How much are you willing to sell the Z608b for? Please contact me @ [email protected] Thank you. Also how much for the 618H as well? Thank you! Hi, I would like to have Z608B. Hello! How much for the 622D and the 625G? Please email me back! Would you like to sell your $618H to me? I’ll take the 618H if you still have it. How much for C513d and c514e? LOL. You list all the rare pieces and hope someone will give them to you??? Good luck with that! Hi do you still have $618H? I will split it 60/40 in your favor if you still have $H Star.Q. I have the rest. Can work out deal or sell the “BA”. i have D517C rare piece. I either need piece D515 A or will sell piece D517. I am willing to go in on that deal as I have all the rest except $C AND $H… IF we can pull it together let am willing to do the deal with you. let me know if your interested by emailing me back. Similarly I am willing to work something out for WC as that is the last one I need there.. I generally only need 1 more for almost all of them. I will list what I am missing on my own post and I Hope people are willing to work something out either via trading other pieces or profit split or straight buy out of that piece. Do you still have this piece? If so, how much are you asking? I have need for any rare pieces, my board is almost completely full with very few exceptions but I don’t have a single rare piece. Make my day! Just need one rare piece for almost every prize. You recommend driving to stores outside of one’s usual shopping area in order to increase one’s luck. The drive around to other stores advice is poor. Save your money, save wear on your car, and shop at the store more convenient to you. I disagree. 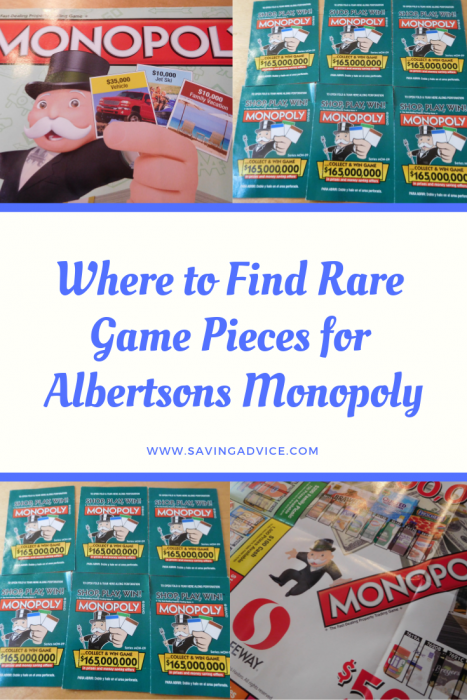 I went to an Albertsons out of my area for about 40 game piece tickets. They all happen to be duplicates what I already had. Meanwhile my local grocery store has had some of the rare pieces what I am finding. Just shop more! I need C-513D. Or if you want to make a cash offer on C-514 contact me. Did you ever purchase C514E? How much are you willing to sell ?622d..
Are you still interested in buying the 622d Anne? I am interested. How much? I also have several extra ?D if anyone needs it. I am looking for BB. I have ?622D for sale. How much are you willing to buy for? Do you still have ?622D I would like to buy it.. I have 613c anyone have h? KEEP IT !! It’s the $$$$$$$ piece. Just buy loads of ramen and collect the other easy pieces. It’s worth 1 million ! I have Y606, but I need Y603. If you find Y603, we could do a three-way split. Hi Chris, seems you are living in Los Angeles? Your phone number has LA code area. I’m looking for $613C, do you still have it? May I call you? I live in Los Angeles too. I have 613C. Send me you info and we can make a deal. Do you by chance still have $613C? I need ?625G, how much do you want for it? I have that piece ($618H) Chance if you are interested please email me at [email protected] or give me a call at 408-561-3947. Im not to into this monopoly game so id take some cash for it get back to me if your interested. Nicole claims to have 618 and 625 and a few others, but she’s “not interested in the game” and doesn’t want to collect her prizes. What does this tell you? Please don’t send money to this person. I need ?625G how much are you willing to take? I have ?625G if interested email me at [email protected] and lets work a deal. If you have all those you should just turn them in and collect your prizes. I’m looking for $618H if you still have it? Nicole claims to have 625, 618 and now CCS whichever that one is. Yet she’s not interested in the game or collecting all her big prizes. What does this tell you? Please don’t send any money to this person. I have F527B (and all other F’s except F528C, which I assume you have) I am open to either selling mine, buying yours, etc. Do you have game piece E525E? Are you interested in working together to collect the prize? We can spilt 50/50? I have game piece F527B. Do you have F528C? If so, please contact me at [email protected]. I have F527B. Contact me if interested. I will like to buy the $618. CALL ME 9733420874. I have F527B. I need F528C. any interest? I have $613C… Anyone have $618H and want to figure out how to $1,000,000? Angie, if you have ?625g please email me! Do you still have it, Angie? If you still have ?625G call me at (225) 288-3563. I have C514E. Do you know who may have C513D? I will pay you 100k today for A625G. Email me. ?625G is the rare piece. I would suggest holding on to it so you can collect the rest for the entire set. Amanda, do you still have it? Hi, do you still have ?-G?? I have ?-D!!! Call me at (225) 288-3563 if you still have ?625G. i sell for $20. i have 619A. I have 617G. Let me know if you’re interested in buying. I will sell my ?622D for a good offer. I have what is tagged as a rare piece: D517C if anyone wants to trade for another rare piece let me know. will sell 619a, please contact me with legitimate offer. Do you have 8z08h that you want to sell? I have 8z608b so if you have the rest we can split?! IF you have one of the rare pieces, don’t sell it, just get the others that you need! Ey did you get A502C? That’s all I need. I’d like to buy it if possible..
i would buy it for 200$. then i just have to wait around for the last one. Yo Brian, any chance of you possibly still having. Piece # $618H?? I have B505A. Let me know what you are offering for it. You can email me at [email protected] if you want to discuss privately. I have B505A please let me know if you still need it. Please email me at [email protected]. I have 622d. Do you still need it? I have E524D. Is this piece equally rare as E252E? I’ve seen people asking for both. I have E524D. Is this piece equally as rare as E525E? I’ve seen people asking for both. Does anyone have B506B Willing to buy! I have A504E, looking for A502c! Samm, do you still have A504E…. I’ll buy it from you. Does anyone have B505A, C514E, Z607A, 613C? looking for pieces 513-514. willing to trade or buy. Please let me know if you have any of these. have ?622D, how much will you pay for it? I have ?622D 500,000 vacation home semi-rare piece willing to sell as I do not have the rare piece. Please let me know if anyone has any of these? I have $613C if you still want it. Call Stephen at (831)426-5288. I’m looking for e525e, willing to buy, or I will sell my piece e524d! Has anyone got ?625G willing to negotiate. Have loads of extras. Would like ?625G want to negotiate? I have loads of spares. Last night while in Tom Thumbs and I’m about to collect my game pieces, I noticed when the cashier went to pull them out of the money tray, there appeared to be some yellow or gold pieces in a separate pile, next to the green ones. Anyone else seen these, or am I just seeing things? I was in a hurry so didn’t even think to ask him about the different color pieces. The gold pieces are for the employees. They play a separate Monopoly game. Looking to buy A502C or can trade for other pcs. If you have it pls call me 650-278-2477.
please email me with what you want for it. Thanks for post that, Im seeing that you can be fraud victim , for being naive…. How we can trade safely by the way???? Will to buy, trade, or split prize.. I need a C513D and C514E. I will pay for these. Name your price. I have an A504E for the $100,000 Luxury Car. I’m willing to trade for a C513D or C514E. Or if you’re selling on of them, please let me know! My desperation to win this is real right now! [email protected] – Email me! We can work this out! Willing to collaborate, or pay cash for any one of those pieces. I have 4 of the 5 for the $35k including the rare C514E. If anyone has C513D please send me an email at [email protected] and let’s discuss! I have C514E if anyone is looking to discuss! I have Rare piece F527B, plus all game pieces which are not rare, most of which I have duplicates of & willing to share to fill in your board for a rare piece. I have the rare $613C piece that I am willing to sell. I have D517C. Does anybody want to by it? I am one away from the $100,000. I am in need of A502C. If anyone has it I will spit the winnings! I am also 2 away from the Million dollar prize (need $613C and $618H..and ?622D, ?625G for the vacation home.I have alot of extras..please contact me so we can win this thing! All I need is 613C & 616H for that prize, 622D & 626H for the other. Willing to buy, split, or trade. I literally have every piece except the rare and simi-rares. I am looking for $618H,$613c,?622d,?625g, will pay good money for them. I have F527B (rare piece) for the $10,000 Vacation. Does anyone have it? If so, let’s work something out. I have Z607A are you still looking for that? Hey Leno or Anyone who needs ZA… I have Z607A & willing to make a good deal on it. Please text or call me at 301 437 8313 Asap. Thanks! I also have an ALMOST FULL BOARD I’m willing to sell if you need a lot of pieces. Seeking B506B. Will pay for this. Anyone have this willing to sell? Email me at [email protected]. From San Diego, California. I also know people that have rare pieces for A504E and C514E that my neighbors have. They are seeking the other rare pieces A502C and C513D. Hi everyone. I didnt realize I have one of the pieces someone may need for the 1,000,000 prize. I have $613c. I would love for someone to buy it or maybe we can do a split. Please email me at [email protected] asap. This is the first blog I have checked. I have $613C. Will provide you with the best deal. Contact me at [email protected]. I have $581c need $618h Any willing to make a deal. I have A504E. Willing to split or trade. Text me at 5404401862. I have B505A LETS GET PAID. Just looking for C513D i will pay or make an exchange.! ! Anyone have B506B? I’m looking to buy. Thanks! Anyone have $618h ?625G a502c I have all the others let’s win together!! Hello I have 613C and I only need 618h. I only need one for each of the monopoly’s on the inside cover. Great Idea. Better yet, make a video of burning yourself up while you’re holding a Z608B. I am looking for the game pieces $613 and $613C if anyone has these please email me at [email protected] so we can work something out. I am going to bid on ?622d. I am the highest bidder so far on ebay for that piece. All Ill need is piece ?625g for the vacation home. Please email me at [email protected] if you have the piece. Willing to split! If anyone has A502C, I got the other ones including A504E and you can have most of the $100,000 prize. If interested, text me at 408 – 313 – 3960. I’m looking for the rare number $618h . Is anyone willing to sell or interesting in maybe splitting? If anyone has C513D I’m willing to purchase and/or trade a whole lot for it. Ella, I have the Home Makeover “B”. Looking for “A”. Interested in going in together? I am in Los Angeles. Need the following. Happy to split proceeds. Contact me at Seattle area Craigslist ad linked in profile and this comment. Have F527B for sale, trade, or split. No scammers or shenanigans. Attorneys available, but fees are always split. I wont be checking here much. Hi, everyone! I am ready to buy one of the rare pieces or let’s share the prize 70/30 (30% I leave to myself, the rest – for you). Contact me via e-mail [email protected], I check it regularly! I have F527B willing to sell for $3,000. Does anyone have B506B? Willing to pay. Thanks! Would anyone happen to have B506B? Hi! I have price ?622G, looking to sell or share prize if you have ?625G. I have 613C and the others for the 1,000,000, but missing 618H. [email protected] Let’s figure something out. Contact me. Or any offers.. Email me. I have $613C & E524D – I am looking to sell them. I accept PayPal. Email me at [email protected] if you are interested in purchasing. Let us blow this Popsicle, email me if you are around DC. If anyone has $618H, please contact me at [email protected]. I have all other pieces for the million except for that one. I have ?622D if anyone has ?622G we can split he 500,000 Vacation home. Huge Money Paid for A502C or $618H. Prove you got one of these and I’ll make you a huge offer. My email is [email protected]. Big money paid for A502C or $618H. Send me a photo of your game piece and I’ll respond with offer. I have $613c, looking for $618h. Willing to sell. Also have E524D, looking for E525E. Need ?625G; if you have it. please e-mail- will negotiate a reasonable split. I have the following rare pieces: $613C, ?622D, C514E. Looking for someone who has $618H, ?625G, and C513D to fairly split the prize. Text me (207) 671-7644. I have $613C and live in northern TX. Anyone with $618H willing to make a deal? Text me at 847-331-4929. In need of 618H… Have all the rest. split me 30% you 70% ?? or ?? I have $613c. Make an offer. I have ?622D to sell if anyone is interested. Email me at [email protected]. I can overnight the piece to anyone who wants to buy it. I’m in need of Z608b, will split prize with whoever has it a bigger percentage for them. Does anyone have B506B??? That’s the only piece I need. Willing to split the prize!! I have $611A through $617G – missing $618H for this major price. If someone has $618H and wants to split in some way please send me an email to [email protected]. I’m in Sedona, Arizona (and would, of course, also travel to let this happen). I have rare D517C and F527B. Looking for D515A or F428C. If you have one of those let’s work out a deal. I’m open to making a great business deal or selling. I have the others in the group! I have $613c email me to work something out! I won last year and found this site so figured I would give it a shot. I have 613c and all apart from 618h. Anyone have it willing to split or seek mine. Not kidding about winning either. Look on back page 35k. Grays lake Illinois. I have C514E for sale. I want $200 now, and a notarized letter stating I will be paid $1,800 more when you receive your cash prize of $35,000. Email me at: [email protected]. I have 622d….just need 625G….willing to split. In need of F528C for Family Vacation. I NEED E525E!! I have all of the other pieces needed for the prize, including E524D. Please contact me for 50/50 split @ [email protected] . Make sure to put MONOPOLY in subject line. Thx!! I have F527B & $613C. Contact me if you need them. by the way, if you still have F527B, we can talk on the phone after 6pm at (928) 302-3391. Let’s make a deal that’s mutually satisfactory,okay? I have B505A. Please let me know if you have B506B and are interested in teaming up for the prize! I have B505A and ?622D. Contact me to make a deal. I have a couple of extra semi rare tickets that I am willing to part with if anyone is interested. I have ?622D for the Million, B505A for the $50,000 Home Makeover, and E524D for the $10,000 Jet Ski. I am also interested in sharing a prize with anyone who might have the winning ticket that I am missing. Here is a list of tickets that I am in need of. I have $613c. Willing to sell for the right price. Straight sale, no split. Cash in person. Missoula MT. DFW Metroplex area, I have ?622D and C514E semi-rares, last day so make me a cash offer. I’m not greedy. A couple hundred would take them both. [email protected], I’ll be checking for the next few hours. Be ready to meet me locally. I have what is lised as a rare $1,000,000 piece. How rare is this piece and what is it worth? How much are you selling it for ? Hi James can you text me if you still have this? Hi everyone, I possess one of the rare pieces for the for the vacation home prize, ticket 8Y16H. If anyone is interested in purchasing this piece please contact me through the information below. Thank you. I need m448B – employee game board willing to trade or buy. I pretty much have everything except the ones in the list. I’ve been only playing for a week. Need help here. These are what I need. Let me know what you need. I have rare 8B99D for $20,000 tuition. Would really like to find E. But might be willing to sell. I have semi rare piece 8C91a 35,000 vehicle of choice. Email me if willing to negotiate. I have one of the rare pieces for the $40,000 home makeover – 8D87B if anyone needs that piece. Email me if you are interested with offers. negotiate. Good luck to all! Do you still have piece 8Z07G ? If anybody have 8B99D, 8Z07G, 8F77A, and 8z08H please contact me at [email protected]. Does anyone knows where game piece ?621C goes on the gameboard? I have semi-rare game piece 9A04C ($10,000 4-Wheeler Prize). If anyone wants to split it with me let me know! You just need the other rare game piece (9A03B)! The game rules say that a $10,000 check is sent (not an actual 4-wheeler) so we can split it half and half. Email me at [email protected] if you’re interested, thanks! 8z08h I’m willing to buy or trade for these. I have some that start with a letter. Got them from the Safeway this week. All the spots on the sheet start with a number. Anyone know what the lettered ones go? I have 8z07g if anyone is interested ($1 Million Cash). I have the 8B99D piece for the $20,000 tuition and will sell. Reply with your email and we can make arrangements. Thanks. Are there any employees trying to match some tickets? I have a full board of huge prizes, but I am missing one on each category. The $100,000 ticket I am missing is A402B. If you have it, contact me at [email protected] and we can talk about how to split the prize. Hello! I am looking for the last piece needed: 8Z0H. Help me! I have an 8Z07G semi-rare. If you have 8B00E then we can split 80/20 and you get the 80. I’m will to split 50/50 for it or negotiate !!! Do you still have this piece ? I have 335ci willing to sell the piece or split the prize.